A word about Sri Mudaliandan Swamy to whose Thirumaligai adiyongal belong to. Sri Rama incarnated HIMSELF as Dasarathi, nephew of Swamy Ramanujar at Purusha mangalam(presently known as Nazrath Pettai in Chennai). Lakshmana’s servitude was incomprehensible and to repay this gratitude, SriRama took avataram as DAsarathi and served Swamy Ramanujar in Kaliyugam. Swamy Ramanujar appointed 74 simhadipatis (disciples) to propagate Srivaishnavam and Dasarathi was their leader. Hence Dasarathi came to be known as “Mudali “”Andan”. Sri Mudaliandan Swamy was entrusted with the job of managing Srirangam temple affairs. 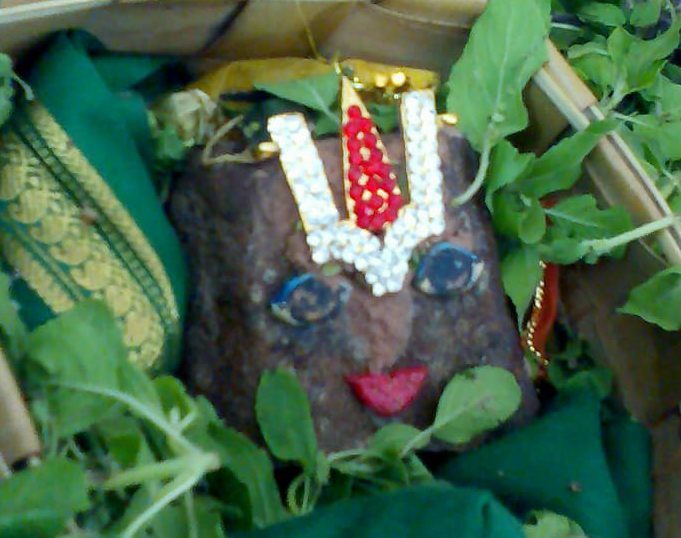 Mudaliandan is known as the “paaduka” and “Tridandi” of Swamy Ramanujar. When Swamy Ramanujar embraced Sanyasasramam, he did not leave Mudaliandan and Kooratazhwan whom he considered as his Tridandam and Pavitram respectively. When Thirugoshtiyur nambi instructed Swamy Ramanujar to come alone to learn about Trimantra rahasyam, Swamy Ramanujar took Mudaliandan along with him. When questioned, Swamy replied that a Sanyasi should always carry Tridandam with him .Such was the intimacy between Swamy Ramanujar and Mudaliandan. Swamy Ramanujar established Vishistidadvaitam with Srirangam as his base and was becoming very popular. The chola king named Krimikanta cholan who was a staunch Saivite was inflicting harm on Srivaishnavas and did not even spare Ramanujar from prosecution. When his soldiers arrived , Kooratazhwan disguised as Ramanujar along with Peria Nambigal attended the king’s summons thus saving Swamy Ramanujar from the king’s cruelties. It was Namperumal’s thiruvullam to make Ramanujar leave Srirangam and purify other places by placing his holy feet in Melnadu and retrieve Thirunarayanan who was worshipped by SriRamar and Sri Krishnar. . Peria Perumal thus created a difficult situation by which Swamy Ramanujar had to leave Srirangam after taking Peria Perumal’s consent and proceeded towards north accompanied by Sri Mudaliandan Swamy. At that time, Jainism was prominent in Mel nadu which was ruled by King Bittideva who was a staunch follower of Jainism. The king’s daughter was possessed by an evil spirit and no one could cure her. Vaduga Nambi, a disciple of Swamy Ramanujar suggested to the queen that his spiritual master was capable of restoring the princess to normalcy. The Jain king invited Ramanujar to his palace to cure the princess but Swamy was initially reluctant to enter a palace. Vaduga nambi persuaded Swamy Ramanujar to resent to the king’s plea which could help in establishing faith in Srivaishanvism. . Swamy Ramanujar consented and sanctified the place , he drove away the evil spirit by placing a dhastamam (stick) on her head uttering some mantra and splashed some water and immediately the princess became normal. (This stick is at Yoga Narasimhar sannidhi in Thondanur . The archakar places the dhastamam on the visitors head and sprinkles water on the face..) King Bittideva, true to his word, became Swamy Ramanujar’s disciple and embraced Srivaishnavism and was named “Vishnu vardhana” and thus the entire kingdom became RAmanujar’s followers. It is told that about 1000 Jain pandits who could not bear this challenged Ramanujar for an argument . To defeat them, Ramanujar advised a curtain to be drawn in between and taking his original form of Adisesha with 1000 hoods, he answered and defeated all the 1000 Jains at a time. This incident happened at Narasimhar sannidhi in Bhakta nagari (presently known as Thondanur). Sri Mudaliandan Swamy rendered “Dhaati Panchakam”in praise of Ramanujar at this place. The places purified by Sri Mudaliandan Swamy’s thiruvadigal during his stay in Mel nadu are :-Srirangapatinam(entry into Mel nadu), Nagamangala(Vijaya sthambam erected here), Saligramam(Sripada theertham-water pond sanctified by Mudaliandan Swamy), Dodda mallur , Melkote and Pancha Narayana temples. 2) the place where HE lay hidden by sand dunes . Swamy Ramanujar with the help of the king retrieved the Moolavar idol of Thirunarayanan and constructed a temple for him and arranged for all utsavams to be performed. First, adiyen would like to thank Chi.Sriram Swami who had shared his recent experiences of visiting Pancha Narayana kshetram and provided all the required information including cab driver’s phone no. . We reached Mysore on 31st May at 10.30 A.M. from Madurai after visiting few avatara sthalams and thiruvarasus of poorvacharyars in and around Chennai, Srirangam and Madurai. The pancha Narayana kshetrams in Karnataka along with important places visited by Swami Mudaliandan can be covered in 4-5 days. Necessary arrangements for our trip like engaging a car for two days, accommodation and food arrangements at Melkote, prashad arrangement at ISKCON ,Mysore were already made. The cab driver Chastamu who can be contacted on 09964387174 is aware of all these places. The charges for Indica are Rs.6/- per day subject to min. 300 kms and Rs.200/- per day as his allowance. Total package Rs.4000/-. From Mysore station, we drove to Talakad which is about 62 kms from Mysore(as per our car reading) and takes about 2 hours. The driver went to the archakar’s house and requested for the temple to be opened for which he consented. We then went to River Cauvery for cleansing ourselves in the crystal clear holy waters which is about 2 kms from the temple and then returned to the temple. On the way, we saw sign boards leading to Pancha Linga temples. Talakad is famous as one of the Pancha Narayana kshetrams and also as Pancha Linga kshetrams. The aged archakar, Sri.Lakshmipathy who can be contacted on 08227-273415 opened the doors of the make shift temple. WE were amazed looking at the divya mangala Thirumeni of Perumal Keerthi Narayanan. The moolavar in Nindra Thirukolam clad in green dress is about 10 feet height with ubhaya nachiyars on either side whose height is about 3 feet. The vigraham is carved in Hoysala style which is a wonder. Performed archanai and offered fruits to the Lord. The archakar informed that as the original temple built by Mudaliandan Swamy collapsed, the deities were kept in this place. This place is declared as a heritage site by Archaeological Department. The ruins of the temple have been collected and numbered accordingly for which ASI needs appreciation. Hopefully, the temple would be renovated soon. In this place, the moolavar vigraham of Sri KeerthiNarayana Perumal with ubhaya nachiyars is in the centre, the moolavar vigraham of Sri Sundaravalli Thayar is kept on the left side and on the right side, we can see vigrahams of Swamy Ramanujar, Mudaliandan and Desikar. Brahmotsavam is performed for 7 days during Chithirai culminating on Utharam (Perumal’s star). Thiru aadi pooram which is Thayar’s thirunakshitiram and acharyar’s thirunakshitrams are performed here. Reached ISKCON at 3.30 P.M. and honoured prasadam. Had darshan of Sri Krishna-Balaram and other deities at 4 P.M. after making few purchases, we left the temple thanking the Lord for everything. Proceeded to Thondanur and reached Nambi Narayanan temple at 5.15 P.M. This Pancha Narayana kshetram located amidst greenery was closed and the archakar who stays nearby refused to open the temple doors. We were dejected as it would not be possible to stay for a day and have darshan of Perumal. The watchman took pity on us and opened the temple door and took us inside which was pitch dark. We had to satisfy ourselves by standing in front of the locked garbagriham of Nambi Narayana Perumal. However, the watchman pointed a sculpture and said that it was the replica of the Lord inside. Paid obeisance to Swamy Ramanujar and thanking the watchman came out of the temple. When we were about to get into the car, we met a Srivaishnava who is the archakar in the nearby Yoga Narasimhar sannidhi who was driving towards Narasimhar temple and instructed us to follow him. A small board displaying Swamy Ramanujar’s temple and Yoga Narasimhar temple welcomed us. The temple is situated on a small hillock near Nambi Naryanan temple is a revered place. The archakar showed us the divya mangala thirumeni of Sri Yoga Narasimhar and placed the dhastamam used by Swami Ramanujar for driving off evil spirits on our heads. Then he splashed some holy water on us and gave us theertha prasadam and was narrating Swamy Ramanujar’s pastimes. We were then taken to another sannidhi in the temple precincts towards right of Narasimhar sannidhi where Swamy Ramanujar is seen is Sesharoopam. It was here Swamy Ramanujar defeated 1000 Jain pandits by assuming his original form of Adisesha with 1000 hoods. Photography is strictly prohibited here. The archakar showed us the Thirumeni of Udayavar which is made of swadhai (made from herbs- similar to Thirukurungudi, Thiruthankaal Perumals) pointing to the eyes which were similar to that of a snake, abdomen and the hoods. Another interesting feature is here Swamy Ramanujar seated in Padmasana shows Jnana mudhra and does not have Tridandam. This thirumeni of Sri Ramanujar is unique which must be seen by everyone. The archakar informed that Swamy Ramanujar is in Sookshma roopam here.?? Devotees whose wishes are fulfilled by praying here , offer white veshti to Lord Narasimhar and kaashayam vastram (orange robe) to Swamy Ramanujar. The archakar who preferred to remain anonymous informed that Perumal can be seen in 3 forms:-Nambi Narayanan,Yoga Narasimhar, Parthasarathy, Venugopalan out of which we were not fortunate to have Nambi Narayanan’s darshan. We visited Venugopalaswamy Temple. The moolavar is Sri Parthasarathy in sitting posture with chathur bhujam holding sankhu, chakram in his upper arms, right lower hastam in abhaya hastam and left hastam placed on HIS lap. Sri, Bhudevi nachiyars are also in veetruirundha thirukolam. Utsavar Krishnar is in dancing style. 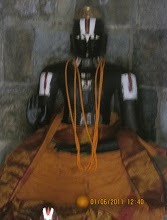 The uniqueness about this idol is Perumal’s right foot is in front and left foot behind. The archakar informed that this temple was about 5500 years old built by Yudhisita. The vigrahams of Chakaratazhwar, Nammazhwar and Ramanujar are placed outside the garbagriham. Thanking the archakar profusely, we left the temple at about 7 P.M. and drove to Melkote. After about an hour’s drive, we reached Melkote- the place close to Swamy Ramanujar’s heart. Archakar Sri Narsiraj Bhattar, whom we contacted earlier on 094487 54696 had arranged for our stay in Belur chathiram(the charges are Rs.300/- per day plus Rs.100/- for extra bed) which is on the way to the temple. We dumped our baggages in the room and rushed to the temple which was about to close. As Bhogam was being offered to Lord Thirunarayanan, the curtains were drawn and we were asked to wait for some time for participating in Sahasranama archana, the last seva of the day.Meantime, we went to obtain the grace of Kalyani Thayar and Swamy Ramanujar. The archakars in Thayar sannidhi who are related to Narsiraj Bhattar stated that Melkote is not Pancha Narayana kshetram and endorsed Talakad archakar’s views. They informed that from Talakad one can reach Melkote via Maddur and Srirangapatinam and need not pass thru Mysore. Just as we reached Perumal sannidhi, the curtains were drawn out and mangala aarthi was being shown to Perumal. Had a wonderful darshanam of Moolavar amidst chanting of Prabhastamham. We then followed the archakar to utsavar sannidhi which is on the left side in the same precincts and had a wonderful darshan of Sampathkumaran /Chellapillai with ubhaya nachiyars. We were informed that only in this temple, there is a separate sannidhi for utsavar. We participated in Sahasranama archanaiand relished Perumal’s soundhariyam.. We were recapitulating how this Perumal showered grace on our Udayavar who is our saviour. After archanai and shodasa upachaarams, Perumal was laid to rest.. A priest came and gave about 6 dosas as prasadam in our hastams. The priest in Thayar sannidhi with whom we intereacted introduced himself as Sri Narsiraj Bhattar’s brother and took us to their Thirumaligai for honouring prasadam. The Lord was gracing us with huge quantities of prasadam that we didn’t have apetitite for another meal. At the same time, we could not refuse the archakar’s hospitality. Learning about our next day’s program to visit Nagamangala, Saligramam and Belur, they advised us to to Belur first as it was very far off and then go to Saligrama via Valiya Narsipur, K.R.Nagar and proceed to Srirangapatinam via K.R.Pettai, Bogadhi, Nagamangala. They called up Sri Krishnaraj Bhattar, their brother who is the chief priest in Belur and informed about our visit. The bhattar was glad to host us on the following day as it was Amavasya. . After taking their blessings and thanking them profusely for their guidance , we retired for the night. We were fortunate to see our Thirumaligai which is adjacent to the bhattar’s house . On 1st June, we suggested the route given by the bhattars to the driver but he refused to follow it and said that his route was the best. We were left with no choice but listening to the driver. Checked out of the choultry at about 7A.M. and drove to Kalyani Pushkarini which is nearby. Sprinkled some water and after purchasing Thiruman kaapu etc., we started off on our journey to Nagamangala and reached at about 9.15 A.M. The temple doors were closed. By this time , we got accustomed to this closures. We tried to enquire from some passerby regarding the temple but unfortunately we just came across a single person with whom we could not communicate properly. We waited for about 15 minutes and decided to leave. Meantime, we peeped into the Hanuman shrine nearby which was deserted. Adiyongal tried to contact Sri Narayana Bhattar, the temple priest on his mobile no. 094487 50603 but there was no response. Circumbulated the Vijaya sthambam erected in front of the temple by Swamy Ramanujar and left the place. After about an hour’s drive, to our utter dismay, we realized that the diary in which we were jotting out details and which contained imp. information was missing. WE were guessing that we would have left it at the temple entrance where we had kept our belongings and again contacted bhattar. Luckily he responded informing that as he was in Bangalore and asked his son to take care of the temple in his absence. Knowing our plight, he helped us by giving their landline number and asked us to contact his family who would go to the temple and check whether the diary was available or not. By Perumal’s grace, we got the reply in affirmative and informed the bhattar about the same. The bhattar opined that this leela was enacted by Perumal to ensure that we visit him again and take HIS blessings as the Perumal is Sowmya Kesavan (Kesavan who is Klesha naasaaya) and suggested us to go back to Nagamangala. The driver said that it would be impossible to travel so far as we had to board the night train to Bangalore. Hence we decided to visit this place from Bangalore. We reached Belur at about 11.30 A.M. The magnificent Belur Chenna Kesava temple also known as Vijaya Narayanan temple is one of the Pancha Narayana kshetrams and attracts many tourists and is a heritage site. WE proceeded to Chenna Kesava Perumal sannidhi and met Sri.Krishnaraj Bhattar and gave his brother’s reference. We were asked to come closer to Perumal’s sannidhi and had a good darshanam. The Lord ,true to HIS name, is very beautiful and enchanting. The Lord is seen sporting a nose ring and anklets as HE had taken the form of Mohini. Since the Lord gives darshan as Mohini, the Thayar is Padithaanda pathini-she doesn’t compete with Perumal by coming outside due to HER surpassing beauty. We were wonderstruck at the beautiful sculptures. The big hall outside the garbagriham was crowded with tourists who were assisted by the local guides in explaining about the sculptures. Marvellous indeed. We then visited a nearby shrine which houses replica of Chenna Kesava Perumal. This sannidhi was not crowded . the archakar informed that this replica of Perumal was engraved and shown to Mudaliandan Swamy and King Vishnuvardhana who gave their consent to go ahead with the original vigraham. This sannidhi and the expenses related to it were borne by Queen Shantala Devi, wife of King Vishnuvardhana. Pointing to a cenre place in front of the garbagriham, the priest said that the queen would dance in front of this Perumal. He took us to other shrines in the temple. When we expressed our desire to have darsanam of Swamy Ramanujar, he informed that it would not be possible as the temple authorities open the sannidhis only twice daily for offering food. The rest of the day, the shrines remain closed. We were saddened to know this and decided to atleast stand in front of the sannidhis and pray for our upliftment. When two archakars came with the keys to open the sannidhi, our joy knew no bounds. It was like a thirsty man getting water to drink. We thanked Swamy Ramanujar for casting his glance on us. They offered the fruits and gave karpoora aarthi. We first had darshan of Swamy Ramanujar and then of Sri Mudaliandan whose sannidhi is on the left. Even the aged archakar who accompanied us was shocked. Thanked the Lord profusely and after taking few photos left the place. The temple was now closed. Sri Krishnaraj Bhattar invited us to his Thirumaligai and we were treated with sumptuous lunch and started off on our return journey to Mysore via Saligramam. On 2nd June, adiyongal along with my sister and brother-in-law visited Dodda mallur, the place visited by Sri Mudaliandan Swamy. Had darsanam of the Lord Navaneetha Krishnan in “Vennai kaapu” and visited shrines of our acharyars. Proceeded to Nagamangala which took about 3 hours . Luckily the temple was open and we had darsanam of Sri Sowmya Kesava Perumal along with our ubhaya nachiyars and utsava murthis ,Narasimhar and Venugopalan. The priest pointed a sculpture on the ceiling explaining that a nagam has coiled itself in such a way that the head (considered to be Rahu) and tail(considered to be Keshu) meet. Hence this kshetram is famous as Raghu-Kethu kshetram and all malefic effects caused by these two planets get cured by visiting this place. The priest hastamed over our diary saying that the watchman had kept it safely. The Vijaya sthambam was inaugurated by Swami Ramanujar and later this temple was built. We reached Hubli on 5th from Bangalore and took a connecting train to Gadag which is about 60 kms from Hubli. Reached the temple at 10A.M. Gadag known as Kruthapuram is one of the pancha Narayana kshetram. The presiding Perumal is Sri Veera Narayananabout 5 feet clad in yellow pithambaram holding chakram on the upper hastam and sankhu on the lower side. The lower right hastam is in abhaya mudra and the Lord holds blossomed Padmam in lower left hastam (like Guruvayurappan). A gadam is placed on the right side. Ubhaya nachiyars-Sridevi and Bhudevi about 1.5 ft are on either sides. The utsava murthi is Krishnar . As the moolavar is Saligrama thirumeni, every day thirumanjanam is performed to Perumal. The dasa avataaras of Perumal are beautifully engraved on the arch covering Perumal. He said that Perumal here is “Darshana Murthi”-we had Thiruvadi darsanam referring to Lord Srinivasar in Tirumala as Kanchana Murthi, Lord Panduranga as Bhajana murthi and Lord Jagannath in Puri as “Bhoga murthi”. As Kruthu muni did penance here, this place is known after him as Kruthapuram” . While circumbulating the sannidhi, we visited Narasimhar sannidhi which is behind Sri Veera Narayanan’s sannidhi. Opposite to Narasimhar sannidhi, we can find a small brindavan (tulasi pot) with Raghavendra Swamy. We were told that saint Raghavendra Swamy visited this place and after he attained Samadhi, as per his instructions, little mud from his Brindavan at Mantralayam was brought and kept in this place. During Sravan month (Aavani), 3days pooja is performed here. Navaratiri utsavam for 10 days and Gokulasthami are celebrated grandly. 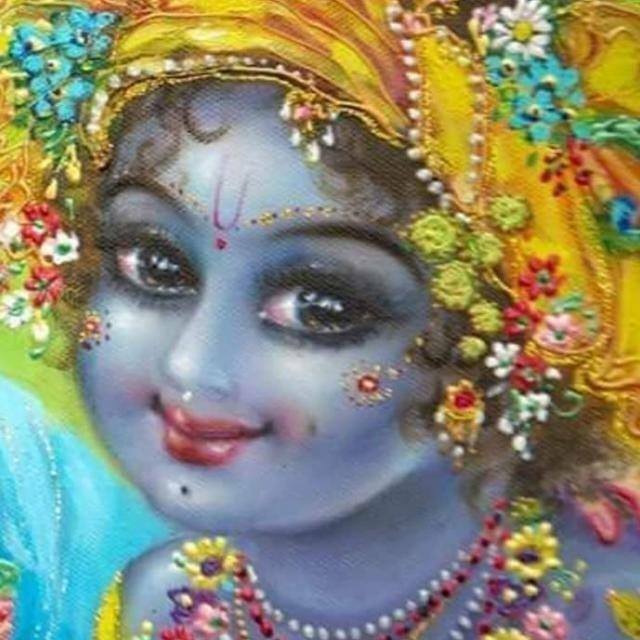 They celebrat Sri Krishna Janmashtami when Rohini is ascendant and decorate the Lord with floral garlands..
Sri Krishnachari gudi who is incharge of temple affairs can be contacted on 099019 15561 and the priest Sri Rameshachargudi on 099457 18229. The temple timings are 5A.M.-12 and 5P.M. -8.30 P.M.
Swamin-Thank you so much for such detailed information. Is it possible to visit the pancha narayana Kshetram alone in 2 days. Since, we didnt have the exact places, could not know how long each of this is placed, to check in google maps. We plan to go in June 2017, and hence, your comments would help. adeyen saw your deep memories and enjoy ful happiness of getting blessings of our purvachereyars by visiting panchanarayana temple and i prays lords blessings for u…. Proud to be born in Nazarath pettai..